Learn how to crochet poppy with this detailed crochet video tutorial. 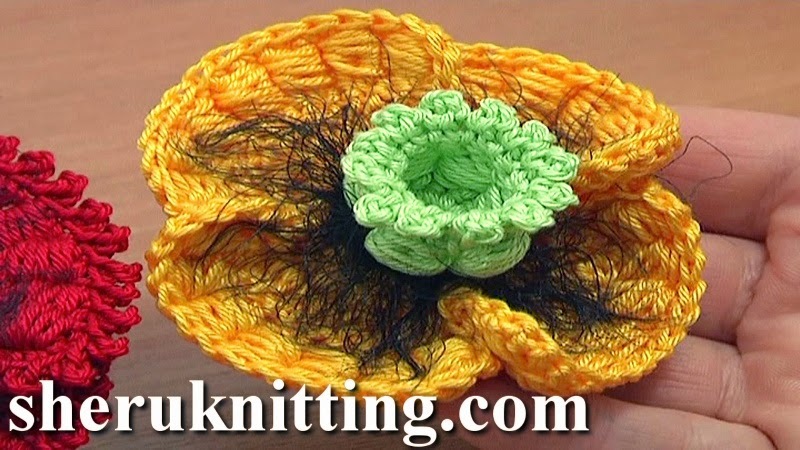 The center for the poppy flower we made in crochet flower tutorial 68 part 1. In this tutorial we continue the work making four petals of double crochet stitches and bullion block stitches. Once all petals are made we continue with a round of single crochet and picot trim. As an option you can make a round of single crochet trim without picots, in this case you flower will look little different but the same beautiful. To make this flower look like real poppy in the center we decorate it with black fur yarn that works as stamens. Thank You for watching and please make sure to subscribe to our channel!